We are adding invoice records to QuickBooks using an Access front end. When we create the records and try to insert into QB the line items seem to go but when the invoice header is inserted we get an error that the Child Record must be inserted before Header Record in BuildXMLHeader. I have examined the data being passed and it all looks correct. I upgraded my QB Premier Plus Professional Services to 2016 (from 2014). I skipped updating to 2015. I installed the new QODBC connector, but cannot connect to my access database. I have tried to uninstall the MS Access Database driver, But I get the error message ODBC call failed- Error 10004. 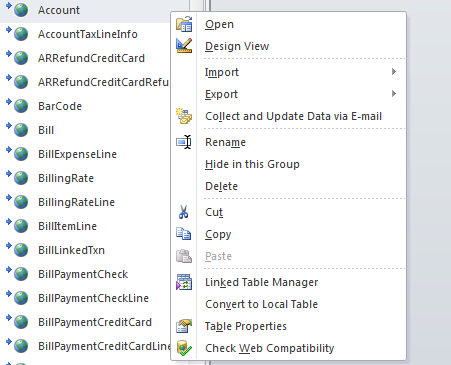 I have MS Access database which contains QuickBooks Data as the linked table. Recently I have changed my Optimizer file path & after changing Optimizer path I am facing slow performance issue. 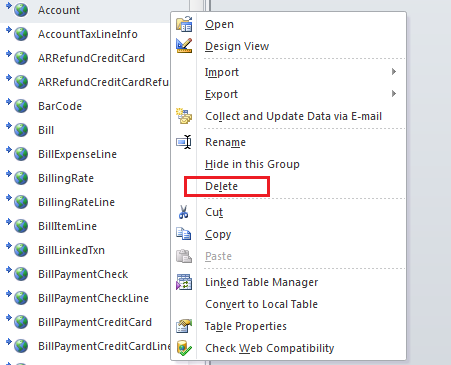 You need to re-link MS Access linked table to resolve the issue. Delete old linked table & re-link it. After changing optimizer file path, you need to Re-Link linked table in MS Access because your MS Access Linked table contains old Optimizer file path. Please Note: Linked Table Manager in MS Access will not update Optimizer file path, you need to Re-Link linked table in MS Access to solve this issue. Solution to this issue is to re-create the linked table. Now Click on the Delete. Now Link the Same Table. After Linking the table, you will get Updated optimizer file path. To view Optimizer file path & other table properties, hover your mouse over table name, So you can view table properties. Please keep QuickBooks running, Logged in as Admin to your company file and try to connect again with MS Access. If above does not resolve the issue, then Please download the latest QODBC version. If Above Solutions doesn't work, please post a ticket to us and we will do a further investigation on your issue.